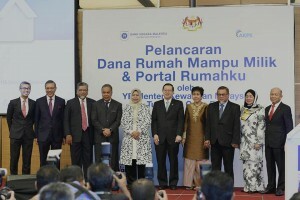 The Real Estate and Housing developers’ Association (Rehda) is optimistic that the newly launched Affordable Homes and Rumahku Portal fund by Bank Negara (BNM) will help boost home ownership within the country. REHDA president Datuk Soam Heng Choon said the fund had a low interest rate and would be especially beneficial for low-income individuals. “There are affordable properties within the country but the issue is that many don’t qualify for financing,” he told reporters on the sidelines after the launch of the fund today. Finance Minister Lim Guan Eng, who officiated the launch, said there were already 16 applications for the fund. BNM’s Fund for Affordable Homes and Rumahku portal is an online financial education module provided by Agensi Kaunseling dan Pengurusan Kredit (AKPK). The maximum financing rate is 3.5% per annum, with a maximum tenure of up to 40 years or up to 70 years of the applicants’ age, whichever is shorter. The fund is applicable for properties below RM150,000. “Among the locations include Alor Setar, Kedah and Seberang Prai in Penang,” she said. AKPK’s RumahKu portal will assist potential borrowers to assess their ability to meet the financial commitments associated with owning a home and their capacity in purchasing and financing their home.